Flowers produced in mid to late April. Large, abundant flowers – red purple buds open to white and pink on the inside – opening before leaves. A very vigorous grower. Late blooming cultivar developed at the US National Arboretum. Foliage remains attractive all season. Part of the ‘Little Girl’ series. 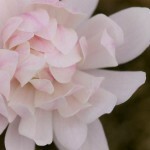 A cross between M. lilliflora ‘Nigra’ and M. stellata ‘Rosea’ Part of the ‘Little Girl’ series. Flowers about 2-4 weeks later (mid-April to early-May) than regular species, reducing the risk of flower damage from early frosts. Compact, shrubby habit. Fragrant, goblet-shaped, fuchsia flowers, before foliage appears. Slow growing. Leaves turn yellow-bronze in fall. This plant can take on a shrub appearance with its lower branches intact, or like a tree with the snip of those same branches. 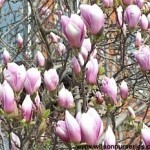 Either way, this magnolia has pink buds that bloom to unique, pale pink, star-shaped blossoms in April . It grows best in moist, well-drained soil and lots of sun. Always popular with its large, tulip-like, pinkish flowers in the early spring before leaves appear and are freely produced. 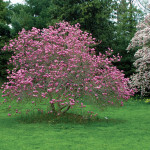 A specimen tree with an upright growth habit while young, becoming more spreading with age. Buds are rosy-purple opening to flowers of white. 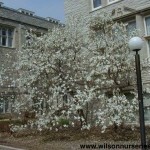 A fast growing Star Magnolia. Very floriferous with masses of pure white, many petaled flowers in early spring before the leaves arrive. Flowers are unharmed by wind and rain. Good specimen plant. 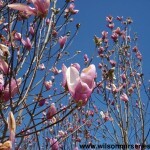 A very hardy Japanese Magnolia. Tough, leathery foliage. An upright shrub that becomes rounded with age. Multistemmed. The dark green leaves are silvery on their undersides and the bark is a silvery gray. 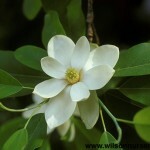 Creamy white fragrant (lemon scent) flowers which appear much later than other Magnolias in May and June. Tolerates moist conditions. Conical narrow, rounded crown. Upright spreading habit. 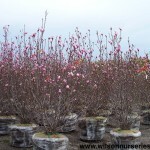 Best grown in moist, rich, well drained soil and protected from high winds. Blooms later spring, and some blossoms even reappear in summer. Dark green, leathery leaves and a rounded habit. A National Arboretum hybrid from M. Lilliflora ‘Nigra’ and M. sprengeri ‘Diva’. Sweetly fragrant, dark red-purple flowers appear late – after danger of frost providing a pleasing and long-lasting display. 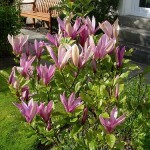 Unlike many Magnolias, it has a narrow upright habit making it suitable for small gardens. Strong branches lessen damage from winter snow load. 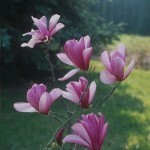 A deciduous hybrid Magnolia resulting from a cross between Mag. Acuminata (seed) and Mag. Denudata (pollen). 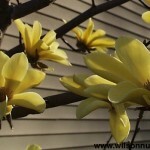 It is noted for its upright, tulip-like, profuse non-fading yellow flowers. Compact pyramidal form and hardiness to both heat and cold set this variety apart. Dark green foliage appears very late after flowering. Free flowering, upright habit which becomes spreading with age. Produces large, fragrant white, star-like flowers in April. Vigorous grower. Flowers in dappled sun, but performs best in full sun. Most vigorous of all M. Loebneri varieties.